Wondering what that weird phrase means that your mom always uses? Got a cousin from another part of the country who uses words you’ve never heard of? Sick of hearing Englishmen say “limey” and not know what it means? This is the resource for you! 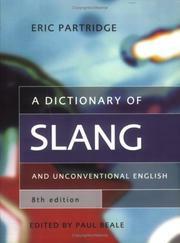 The Dictionary of Slang contains the meaning and history of thousands of words that you may have wondered about. Check it out! “23, Skiddoo!” a phrase meaning, “get out!” or “let’s go!” is considered to be “the first truly national fad expression”?